Welcome to the second day of sneak peeks of the September Sparkle Creations Rubber Stamps release! 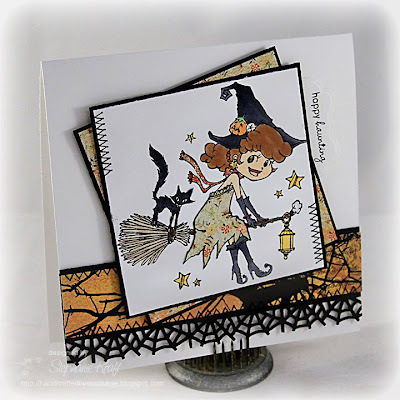 Sparkle is releasing 3 new images at midnight EST this Saturday, September 11.. Today the team is showing Broomstick Lucy! Say hello to Broomstick Lucy.. I am thinking that she's a nice witch! I colored her with Copic markers and paper pieced her dress. I tried to keep my layout fairly simple again, though I added a few more layers than I did yesterday.. :-) I wanted to add a line of tiny black pearls under my "Happy Haunting" sentiment to make it pop out a little more, but alas, I only had white. I colored my pearls with a black Copic marker, then I didn't wait long enough for it to dry. So, I smudged my card base and sentiment (cut out of Labels Fourteen Nestabilities) and had to start over. Needless to say, I left off the pearls and was just happy that I didn't ruin my image! I used an old Mojo sketch for inspiration (mojo144). Be sure to visit the rest of the SCRS designers for more peeks of Broomstick Lucy. Sparkle will be giving away a Broomstick Lucy to one lucky person! For a chance to win, you need to comment on all of the designer's blogs (list below). Then head on over to the SCRS blog and comment on the Lucy post. You have until midnight EST each day to comment. The lucky winner will be announced the following day! I'll be back tomorrow (release day) to show you the final image. All 3 September images will be available for purchase in the store! Thanks so much for stopping by! Accessories: Labels Fourteen Nestabilities (Spellbinders), Spider Web border punch (Martha Stewart), Markers (Copic), Star Dust Stickles (Ranger), Foam tape, Thread, Sewing machine. Very cute, love the paper peicing on her dress. I love the simplicity of your card and the accent of the black. The layers are perfect and that dp is so cute with the web border. Super cute stamp!! Going to check out yesterdays!! Such a cute card! I love her dress! Beautifully done card...I love the spider webbing! Oh wow this is awesome. The coloring is great. Love how you paper pieced her dress. Cute! soooo sweet Stephanie...love the image! What a super cute card Stephanie! Lucy is cute as ever and your detailing is fabulous! Especially the spider web, I love it! I really love the style of your cards, Stephanie! Love how you paper pieced Lucy's dress! She's so cute and looks great paper pieced. Fabulous card. Oh I love it! The white with the dramatic accents is stunning. This is so cute!! I HAVE to have that web border, SO cute! Love the soft effect achieved by these colours, classy & really autumnal. Fantastic coloring and sweet witch. The angled composition is beautiful.